Litz wire is a type of cable used in electronics to carry alternating current. The wire is designed to reduce the skin effect and proximity effect losses in conductors used at frequencies up to about 1 MHz. It consists of many thin wire strands, individually insulated and twisted / bunched, grouped or braided / woven together, as per the specific design and application. This often involves several levels (groups of twisted wires are twisted together etc.). This winding pattern equalizes the proportion of the overall length over which each strand is at the outside of the conductor. 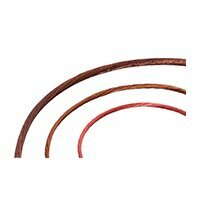 The individually insulated copper strands are basically the insulated magnet wires laid in form of cable strands. Typical applications for litz wire conductors include high-frequency inductors and transformers, motors, relays, inverters, power supplies, AC/DC converters, communication equipment, ultra-sonic equipment, sonar equipment, television equipment and heat induction equipment. The new innovations in information technology and communication devices have opened tremendous opportunities of usage of litz wires. A latest example can be a wireless mobile charger. Bunching / twisting can be customized as per customer drawing.